Food preparation workers work in cafeterias and restaurants under the direction of cooks, chefs, and food service managers. They prepare cold foods, slice meat, peel and cut vegetables, brew coffee or tea, and more. When needed, they retrieve food, clean and put away equipment, and unload deliveries. They may also use kitchen equipment, such as dishwashers, blenders, slicers, or grinders. Some food preparation workers stock and operate soda machines, coffeemakers, and espresso machines. The work is often strenuous. Workers may stand for hours at a time cleaning or preparing ingredients. Some may be required to lift and carry heavy pots or supplies. 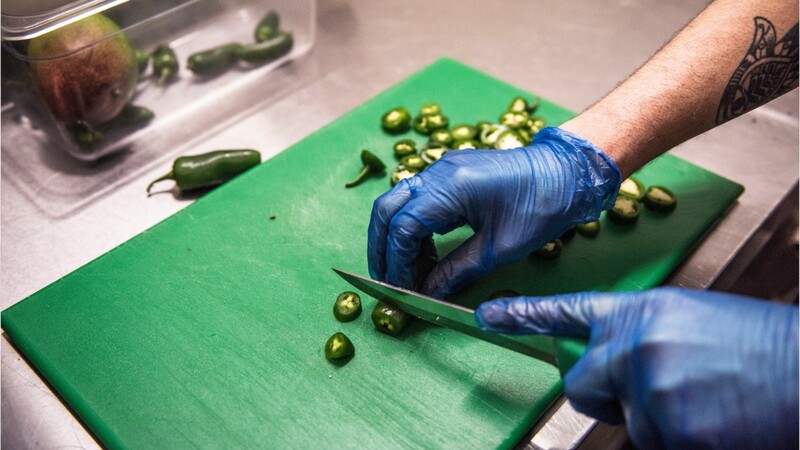 In fast-paced kitchens, staff must work together to ensure dishes are prepared quickly and properly. Kitchens have many potential safety hazards and food preparation workers have a high rate of minor injuries. To reduce risks, workers often wear gloves, aprons, and nonslip shoes. About half of food preparation workers work part time early mornings, late evenings, weekends, and holiday shifts are common. Those working in school cafeterias generally have more regular hours, with time off during school vacations. Seasonal employment is also available. Food preparation workers typically learn through on-the-job training that covers how to handle and prepare food, as well as basic sanitation and workplace safety regulations. No formal education or previous work experience is required. See more details at O*NET OnLine about food preparation workers. Food Preparation Workers by U.S. Department of Labor, Employment and Training Administration is licensed under a Creative Commons Attribution 4.0 International License.